WRONG!!! See how I set that up? Now you can tell time or make phonecalls in the most piratey fashion possible thanks to BudgetGadgets.com, who now offer two solutions to let you sport technology without betraying the pirate code (I believe that somewhere in the code it does indeed forbid the public usage of all non-piratey technology.) 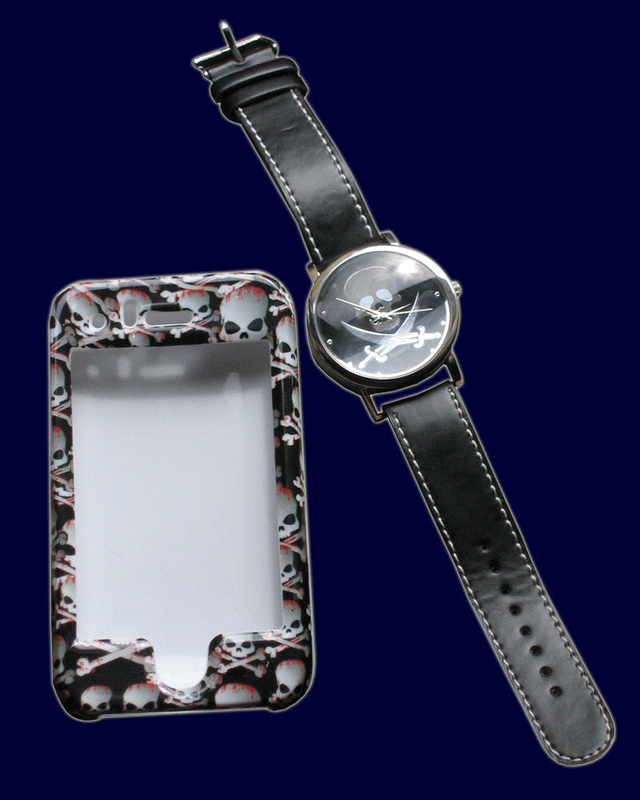 We’ll begin with the iPhone case, which is made up of two pieces of plastic that readily snap together to cover your phone from top to bottom in skulls and crossbones. Appropriate openings provide ready access to the screen and other ports, so once installed you should never ever ever have to remove this case and leave your iPhone to wallow in non-piratey shame again. Being as I don’t have an iPhone, I had considered demonstrating this case’s cross-platform functionality by lashing it to my clamshell motorola with twine, but that would just be silly. But even those of us not fortunate enough to own iPhones have wrists (well, most of us, anyways), which makes us prime candidates for the BudgetGadgets.com pirate wristwatch (actually titled the Newfashioned Leather Strap Wristwatch V2). With a real leather wristband, large face, and stainless steel, water resistant body, this watch is emblazoned with a large silver jolly roger that tells the world you’re a pirate through and through. The second-hand motion projects a healthy “tick… tick… tick…” sound that broadcasts the steady approach of doom – whether the doom is to be your own or the lubber standing alongside is for you to decide. A couple of great – and surprisingly inexpensive – pieces of technology to help you maintain you keep “your pirate on” during those times that wearing a tricorn hat and drunkenly swinging a cutlass around your head is deemed social awkward. This entry was posted in Other by Bilgemunky. Bookmark the permalink.